The notion of consuming a bathtub full of tea leaves me with mixed feelings. There are certainly varieties of tea that I could stand to drink in those quantities. 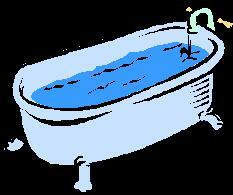 But, let's face it, ruminating on the combination of tea and bathtubs is enough to leave you feeling a little queasy. These thoughts just didn't occur to me out of the blue, as you might have guessed. About a week or two ago the British press was all aflutter over the news that the average "tradesman" there drank the equivalent of a bathtub full of tea over the course of a year. British plumbers, locksmiths and electricians drink 3.83 cups of tea every day while on the job, or so we're told. That's 900 cups a year, or about 70 gallons. Which is enough to fill up the tub 1.3 times. The story was all over the British press. It's a quickie, but you can read it in the Edinburgh Evening News here or the Daily Record here. Speaking of Britain, here's a story from the (London) Times about how the merchant Fortnum & Mason ("the Queen's grocery store") supplied some tea-starved British troops serving in Iraq.